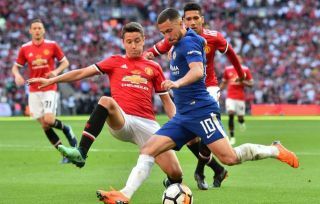 Eden Hazard’s first half penalty was enough for Chelsea as they claimed a 1-0 FA Cup final victory over Manchester United at Wembley this evening. It wasn’t a classic encounter between the two clubs, though it was still not short of talking points as Antonio Conte managed a second trophy in as many seasons in charge of Chelsea, while Jose Mourinho and United end the campaign empty-handed. In the end, you’d have to say Mourinho paid the price for some negative tactics, with Ander Herrera’s man-marking job on Hazard not really working at all in the first half when the game was ultimately settled. Big names like Paul Pogba and Alexis Sanchez were found wanting on the big occasion, and this result brings many questions over Mourinho’s position at the club after two below-par seasons in charge. He’s endured a frustrating season, playing a number of different roles and failing to do enough to steer a generally struggling side out of trouble, but today Hazard dominated on the big stage with a superb performance. First, he slotted away his penalty like a true pro, and, as noted in his half-time analysis by Alan Shearer, he used Mourinho’s tactics against him by taking Herrera completely out of the game. ‘What you do is, do exactly what Hazard’s doing – go and stand near the centre-halves,’ Shearer said on the BBC at half time. Fair play to Phil Jones. You get a Wembley gig, you play the hits. Celebrating his, shall we say, *surprise* call-up to the England squad this summer, Jones really did bring out all the hits here today. First, he completely failed to read the game on the opening goal, with one simple touch from Hazard leaving him what looked a mile behind the Blues star, with a penalty from a crazy last-ditch challenge looking the only ever realistic outcome. The weird thing is, if reports are to be believed, it will be Antonio Conte’s final match as Chelsea manager, while Mourinho stays on at Old Trafford. Given how the two managers have performed over the last two seasons since taking jobs at their current clubs, it doesn’t make a huge amount of sense. Sure, United finished higher in the league and the tension between Conte and Chelsea has been clear since last summer, so maybe this is how it has to be. Still, after a trophyless season and some drab football in games as important as this one, real questions must be asked of Mourinho and his ability to get more out of this expensive, star-studded squad. On the face of it, Conte’s line up looked the riskier one from the beginning, with a change to a 3-5-2 leaving Chelsea with little in the way of width or quality up front. And yet, it was Mourinho’s negative decision to have Herrera man-marking Hazard that proved one of the costliest errors on the day. Where once the Portuguese’s tactical decisions used to decide big games in his favour, they have now become a hindrance.